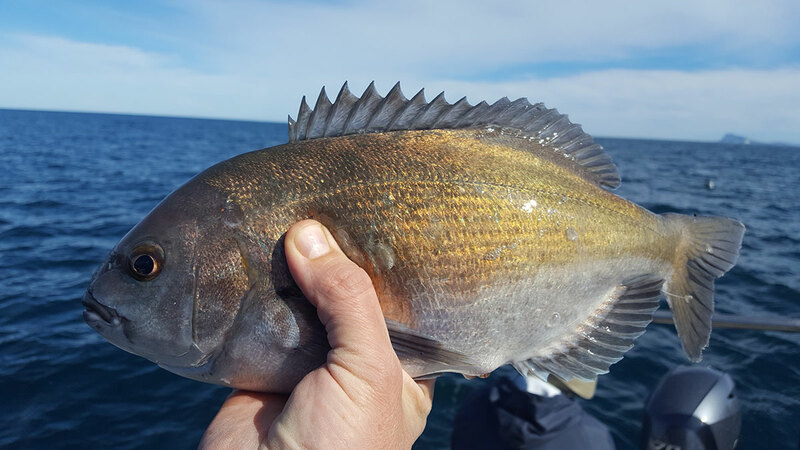 The hottentot (Pachymetopon blochii), also known as the Hottentot seabream, is a species of sea bream in the family Sparidae, native to the southwestern coast of Africa. The hottentot has a bronzy grey color, with darker fins. The small mouth contains five rows of incisors in both upper and lower jaw, but no molars. Adults are commonly around 25 cm in length at the age of maturity, but may reach up to 54 cm, with a maximum recorded weight of 2.67 kg. The species is a generalist and feeds on seaweeds, algae, crustaceans, worms, molluscs, sea urchins, and occasionally small fish. It may spawn all year round, with peaks in summer and winter. Individuals generally live to an age of about 12 years, but may exceptionally reach an age of up to 21 years. Generation length is about 9 years.